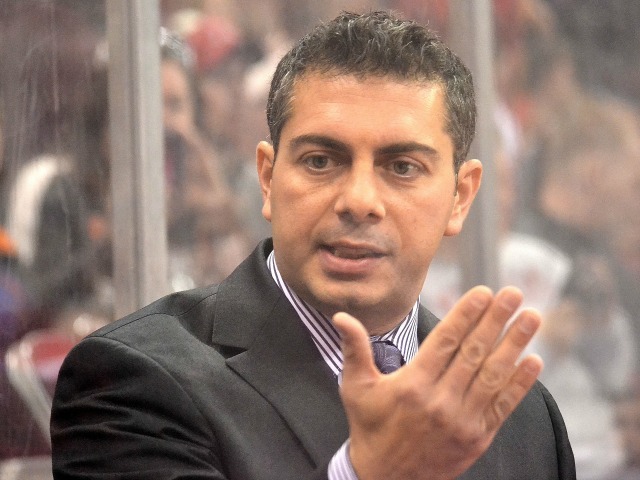 Miami coach Enrico Blasi was sent a letter of reprimand by the NCHC for his actions during Saturday’s game, College Hockey News reported today. The RedHawks lost on a 5-on-3 goal late in the third period, and while the teams were forming the postgame handshake line, Blasi walked out to referee Scott Bokal at the blue line and berated him. Bokal gave it back to Blasi before skating away, ultimately issuing him a game misconduct. Blasi was irate when the call was made, and after the decisive goal was scored, he grabbed one of his player’s sticks and made a motion as if he was going to throw it onto the ice before smashing it into pieces on the boards. BoB discussed this whole incident more thoroughly in Saturday’s game report here, but this is really the first time Blasi has exercised the nuclear option in nine years, and he was obviously venting the frustration of a two-month winless streak. According to the article, the letter said that the reprimand stems from “unsportsmanlike actions and comments toward on-ice officials during and immediately following Miami’s game,” according to the NCHC. Whatever he said to Bokal after the game was probably really bad, since Blasi wasn’t penalized for breaking a stick although that was mentioned in the reprimand. But Bokal had been hearing it for the better part of 15 minutes and being on skates – as opposed to Blasi who was wearing dress shoes – could’ve easily fled by taking two strides back rather than compound the issue by engaging a clearly furious coach. It is fair to point out this was Blasi’s second bench blow-up in as many weekends. He screamed at his associate coach, Peter Mannino, during the opener of the RedHawks’ homestand on Jan. 18. The old-school hockey fan in me doesn’t have that much of a problem with Blasi’s actions once a decade, and honestly if this is finally the spark the team needs to start playing competitive hockey, this tirade was somewhat welcome. And the league did the right thing here, publicly showing its disapproval but choosing not to suspend Blasi. Posted on January 29, 2019, in 2018-19 and tagged 2018-19 miami redhawks, Enrico Blasi. Bookmark the permalink. Leave a comment.